Yes, things are terrible for the Xbox One in Japan. Everybody knows that. But did you know that one major retailer is selling the console as an Ultra HD Blu-ray player? It’s true. 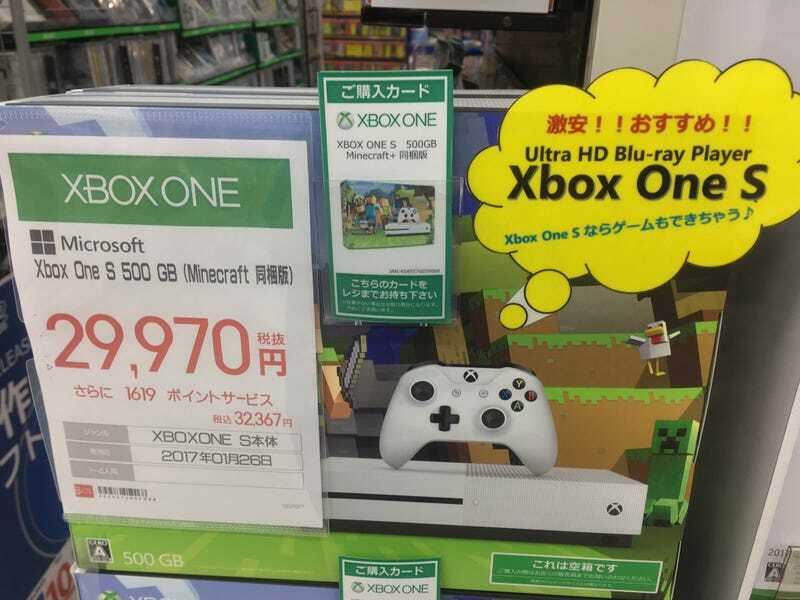 The Bic Camera in Yurakucho, one of the biggest electronics stores in Tokyo, is selling the Xbox One S as first and foremost an Ultra HD Blu-ray player. The photos below were snapped by YouTuber Gaijin Hunter. The top of the notice reads “Super Cheap! !” and “Recommended! !” The bottom part of the notice reads, “If it’s Xbox One S, you can also play video games.” It’s like the playing video games part is an added feature, not the feature. However, this Twitter user claims to have bought an Xbox One S to watch hit anime Your Name on UHD BD. While this Twitter user picked up an Xbox One S after getting a 4K television. This is one of the cheapest Ultra HD Blu-ray players you can buy in Japan, so maybe this is helping sales, however small they are.